Politicians and the general public have condemned the arrest of the president of the Cameroon Renaissance Movement, Prof Maurice Kamto and other militants of his party. Barrister Akere Muna, and Edith Kabang Walla have qualified the arrest as illegal calling for their unconditional release. Prof Maurice Kamto and Co. were arrested at the residence of one of the prominent members of his party, Albert Dzongang in Douala on the night of Monday January 28. Edith Kabang Walla of the Cameroon People’s Party, CPP, also echoed on her Facebook page. “Through this repressive wave, Mr Biya’s regime confirms, for those who still doubted, its fundamentally repressive and arbitrary nature. The violent treatment of political demands will exacerbate tensions and make the situation increasingly explosive…the CPP strongly condemns this approach. The CPP requires that the arrested be released and above all, that their rights and freedom be scrupulously respected” she said. Report holds that Kamto and others, arrested by the Cameroonian police and ferried to Yaounde are currently behind bars. Talking to Equinox Television, the secretary general of the party, Barrister Ndong Christopher said some party militants were taken from the hospital unrecovered and ferried to detention facilities. One of such a case, is Celestin Djamen who was treated after suffering a bullet wound in the leg. He added that the protest was legal as the protester were decrying ill practices in the country, that is; electoral fraud, violence in English Cameroon and withdrawal of AFCON hosting Right. 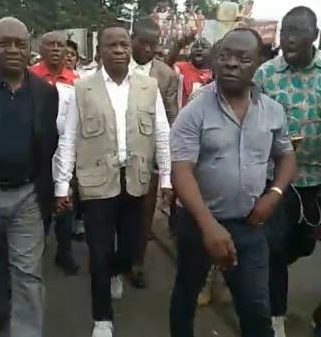 On Saturday January26, thousands of the CRM party members stormed the streets of Douala, Yaounde, Bafoussan and Mbouda denouncing electoral fraud and violence in the two Anglophone regions. Report says they were brutalised, maimed, arrested and taken to detention facilities. In a joint press conference on Sunday by The Minister of Territorial Administration and that of communication, MINAT Boss Paul Atanga Nji outlined that the number behind bars is over 100 and that those arrested will faced the law when due time comes. Out of the country, CRM members equally stormed the Cameroonians embassies in France, Belgium and Germany destroying enormous material. The move has equally been condemned in strong terms in a communiqué signed by the secretary general of the ruling CPDM central committee JEAN Nkuete. The government through its spokesman Rene Emanuel Sadi said the protest was illegal and should not be tolerated as he debunked claims that live ammunitions were fired on protesters. Reacting in same dimension, the Territorial Administration Minister Atanga Nji threatened that the CRM party will banned if it continues with it violence. He concurred with Minister Sadi that no live ammunitions were used and that anything contrary to that was “fake news”. His reaction is based on a video that circulated on social media showing Barrister Michel Ndoki been rushed to the hospital with a bleeding leg. Another member of the party Celestine Njamen as we learned was equally shot and is now in detention according Barrister Ndong Chrisstopher. Another video emerging from Douala shows an officer ordering a protester to move in front of him and march as planned. He then proceeded to shoot the man in the leg, and then order him to get up and march. The limping man got up and limped forward as the officer followed. Minister Atanga Nji cautioned saying, “break time is over” he said “they should not take the government’s leniency as a signed of weakness” he emphasised. In a communique we are yet to confirm its authencity, the CRM and the Social Democratic Front Party have entered in alliance to further protest until Biya’s government is crumbled. SDF protested few days before the CRM Protest and its leaders Joshua Osih Nabangi and Jean Michele Nitcheu were brutalised, arrested and taken to unknown destination and later on released. These are parties that went in for the October 2018 presidential elections but were humiliated by over 70% victory of President Paul Biya. Normally I don’t read post on blogs, however I wish to say that this write-up very forced me to take a look at and do so! Your writing style has been surprised me. Thanks, very nice article. Thank you for another wonderful article. Where else could anyone get that kind of information in such a perfect way of writing? I have a presentation next week, and I’m on the look for such info. I needed to put you this tiny observation to help thank you very much as before on the nice knowledge you’ve documented here. It was really particularly open-handed of people like you giving openly exactly what most of us might have sold as an e book to help with making some bucks for themselves, principally since you could possibly have tried it in the event you desired. These points likewise worked as the fantastic way to fully grasp that most people have a similar fervor really like my personal own to know the truth lots more in regard to this matter. I am sure there are numerous more fun occasions up front for individuals who examine your website. I truly wanted to develop a brief word to be able to appreciate you for some of the fantastic suggestions you are sharing at this website. My particularly long internet look up has at the end of the day been recognized with useful content to talk about with my co-workers. I ‘d declare that we readers are truly blessed to live in a very good place with many wonderful people with very helpful suggestions. I feel quite fortunate to have come across your entire web pages and look forward to some more awesome minutes reading here. Thanks a lot once more for all the details. I’m just commenting to let you be aware of what a beneficial experience my cousin’s daughter experienced reading your blog. She even learned some details, not to mention what it’s like to have an awesome coaching character to have many people just comprehend chosen complicated things. You really did more than her desires. Many thanks for supplying these informative, trusted, explanatory and also fun tips on the topic to Gloria. I want to express some appreciation to this writer for bailing me out of this condition. As a result of surfing throughout the online world and obtaining methods which are not pleasant, I assumed my life was done. Living devoid of the approaches to the difficulties you have fixed as a result of your main site is a serious case, and the ones which may have in a wrong way damaged my entire career if I had not noticed the website. Your good ability and kindness in controlling a lot of stuff was very helpful. I don’t know what I would’ve done if I had not encountered such a stuff like this. It’s possible to at this moment look ahead to my future. Thanks very much for your reliable and amazing guide. I won’t hesitate to recommend your web blog to anyone who ought to have counselling about this area. I am glad for writing to let you understand what a extraordinary encounter my cousin’s girl encountered reading your web page. She noticed numerous pieces, which included how it is like to have a great coaching nature to let other individuals without problems know a variety of impossible matters. You truly exceeded our own desires. Many thanks for offering the essential, trusted, edifying and cool tips on the topic to Gloria. Thanks so much for providing individuals with an exceptionally memorable possiblity to read articles and blog posts from this website. It is usually very ideal plus stuffed with a lot of fun for me and my office mates to search your web site not less than 3 times per week to find out the new items you have. And indeed, we are usually happy with all the amazing hints you give. Certain 2 facts in this article are easily the most effective we have had. Thanks for all of the labor on this website. My mom really likes engaging in investigation and it’s really easy to see why. Many of us notice all about the powerful mode you produce functional solutions via the web site and as well encourage participation from others on that concern so our daughter is actually discovering so much. Take advantage of the remaining portion of the year. You’re carrying out a good job. I truly wanted to write a small word so as to express gratitude to you for these stunning steps you are placing here. My extended internet research has finally been paid with sensible facts to exchange with my partners. I would express that many of us website visitors are quite endowed to be in a decent network with many marvellous professionals with great principles. I feel very much blessed to have used your web page and look forward to really more excellent minutes reading here. Thanks again for everything. I have to express my appreciation to the writer for bailing me out of this type of condition. As a result of exploring throughout the the web and coming across ideas that were not pleasant, I figured my entire life was done. Existing without the strategies to the problems you’ve solved as a result of your main short post is a serious case, as well as the ones that might have adversely damaged my entire career if I hadn’t come across your web blog. That understanding and kindness in playing with a lot of stuff was very useful. I’m not sure what I would’ve done if I hadn’t come across such a thing like this. I can also at this moment relish my future. Thanks so much for your skilled and amazing help. I will not be reluctant to refer your web site to anybody who needs and wants direction on this issue. I needed to write you the little bit of word to help thank you so much yet again regarding the gorgeous opinions you’ve contributed in this case. It is so strangely generous of people like you to supply publicly all that a number of people would have distributed as an ebook to help make some profit for their own end, most importantly considering the fact that you could have done it if you considered necessary. The creative ideas also worked as a great way to recognize that most people have similar keenness similar to my very own to realize a whole lot more with regard to this condition. I know there are several more enjoyable periods ahead for folks who view your site. I simply wanted to thank you very much again. I do not know what I could possibly have accomplished without the entire secrets contributed by you concerning such industry. This was a real challenging scenario for me, nevertheless being able to see the expert mode you solved the issue made me to cry with joy. I am happy for the advice and thus pray you really know what an amazing job you’re providing instructing many others through the use of your web site. Most likely you have never encountered all of us. A lot of thanks for each of your effort on this web page. Gloria take interest in setting aside time for investigation and it is easy to understand why. I notice all regarding the powerful mode you render very important tips by means of the blog and even inspire contribution from the others about this issue and our own princess is becoming educated a great deal. Take advantage of the rest of the new year. You are performing a terrific job. I want to express my appreciation to the writer just for rescuing me from such a situation. Right after exploring through the the web and getting concepts which are not helpful, I believed my life was over. Being alive minus the answers to the difficulties you have sorted out as a result of your good article content is a crucial case, and the kind that would have negatively damaged my career if I hadn’t encountered your site. Your main mastery and kindness in controlling all the stuff was useful. I am not sure what I would have done if I hadn’t come across such a thing like this. I am able to now relish my future. Thank you so much for this impressive and effective help. I will not be reluctant to propose your blog post to anyone who requires guidelines about this matter. I have to point out my affection for your generosity giving support to those people that really need guidance on in this content. Your real dedication to passing the message along came to be incredibly practical and has continuously empowered professionals much like me to achieve their aims. Your entire warm and friendly information can mean much a person like me and especially to my peers. Many thanks; from each one of us. I in addition to my pals ended up studying the best guidelines found on your web site and then before long I had an awful feeling I had not thanked the web site owner for those techniques. The boys were definitely absolutely thrilled to study all of them and have now in actuality been taking advantage of them. Appreciate your really being so accommodating and then for selecting such incredible useful guides most people are really wanting to learn about. My very own sincere apologies for not expressing gratitude to you sooner. I just wanted to write a word to be able to say thanks to you for all of the magnificent secrets you are writing on this website. My incredibly long internet look up has now been honored with excellent insight to share with my company. I would repeat that many of us site visitors actually are quite lucky to dwell in a fantastic network with so many brilliant professionals with useful ideas. I feel quite lucky to have seen the web site and look forward to really more fun moments reading here. Thanks a lot again for everything. I am only writing to make you know what a awesome discovery my cousin’s daughter obtained reading through your blog. She realized so many things, not to mention what it is like to possess an excellent teaching mindset to make folks really easily learn a number of problematic subject matter. You truly did more than visitors’ expected results. Thank you for displaying those important, dependable, informative and as well as unique thoughts on the topic to Sandra. I and my friends were taking note of the best advice found on your site and so immediately came up with a terrible feeling I had not expressed respect to the web blog owner for those secrets. Those young men are actually as a consequence passionate to read them and now have simply been taking advantage of these things. Many thanks for actually being well accommodating and for selecting this kind of smart subject matter most people are really wanting to discover. My very own honest apologies for not expressing gratitude to you earlier. I precisely needed to thank you so much once more. I’m not certain what I could possibly have used in the absence of those recommendations provided by you relating to such a subject. It became a very horrifying matter in my view, nevertheless encountering the specialized style you handled the issue took me to cry for gladness. Extremely grateful for your guidance and thus have high hopes you comprehend what a powerful job that you are doing training people by way of a web site. Probably you haven’t got to know any of us. I precisely wanted to thank you very much again. I am not sure what I would’ve implemented without the ideas shared by you about such a theme. It has been a real traumatic scenario for me personally, but looking at this professional fashion you dealt with that forced me to cry for contentment. I will be thankful for this help and as well , pray you comprehend what a great job your are undertaking training many others through the use of your web page. I am certain you have never come across all of us. I must convey my admiration for your kindness for those individuals that must have assistance with this one study. Your special dedication to passing the message all around turned out to be wonderfully invaluable and have truly made girls like me to realize their targets. This informative guidelines denotes a whole lot to me and additionally to my office workers. Many thanks; from everyone of us. My wife and i have been thankful when Peter managed to finish up his web research while using the precious recommendations he got in your site. It is now and again perplexing to simply continually be giving for free secrets and techniques many others may have been selling. And now we already know we’ve got the website owner to thank for that. The explanations you’ve made, the straightforward web site menu, the friendships you will make it possible to create – it’s everything excellent, and it’s assisting our son in addition to us feel that the content is fun, which is tremendously indispensable. Many thanks for the whole thing! My spouse and i felt absolutely fulfilled that Jordan managed to carry out his inquiry through the entire ideas he discovered from your blog. It’s not at all simplistic just to possibly be freely giving points which often many people have been selling. We do understand we have the website owner to thank for this. The most important explanations you’ve made, the easy website navigation, the relationships your site aid to foster – it is all terrific, and it’s really leading our son in addition to our family feel that that issue is excellent, which is quite important. Thanks for all the pieces! I just want to tell you that I am just new to blogs and actually enjoyed this website. Likely I’m going to bookmark your blog post . You actually have amazing stories. Kudos for revealing your webpage. I as well as my guys were found to be looking at the nice helpful tips located on your web page and then the sudden got a horrible suspicion I had not thanked the web site owner for those strategies. These people ended up totally happy to read through them and now have in truth been making the most of those things. Appreciate your being simply thoughtful and also for deciding upon these kinds of quality resources most people are really needing to be aware of. My very own sincere regret for not expressing appreciation to sooner. I simply wished to thank you so much once more. I am not sure the things that I would’ve gone through without the entire advice shown by you relating to my problem. Previously it was a fearsome situation in my view, nevertheless taking note of a new professional avenue you processed the issue forced me to leap over fulfillment. Now i am happier for the help and even sincerely hope you are aware of a powerful job that you’re undertaking instructing many others thru a web site. More than likely you’ve never met any of us. I must express thanks to the writer for bailing me out of this type of scenario. As a result of surfing through the online world and meeting opinions which were not powerful, I thought my entire life was gone. Existing without the solutions to the difficulties you have fixed through your good short post is a serious case, and those that could have negatively damaged my entire career if I had not encountered your web blog. Your main natural talent and kindness in handling all the details was crucial. I don’t know what I would’ve done if I had not encountered such a stuff like this. I am able to at this point look forward to my future. Thanks for your time very much for your professional and results-oriented help. I will not think twice to endorse the blog to any individual who needs to have guidance on this problem. I must show my appreciation to this writer for bailing me out of this particular dilemma. After checking through the search engines and obtaining tricks that were not productive, I figured my entire life was done. Living devoid of the strategies to the difficulties you’ve resolved all through this short post is a crucial case, and the kind that would have in a negative way affected my career if I hadn’t noticed your web site. Your personal understanding and kindness in handling all the stuff was vital. I am not sure what I would’ve done if I hadn’t come across such a step like this. I’m able to at this point look ahead to my future. Thanks a lot so much for this reliable and result oriented guide. I will not be reluctant to refer your blog to anybody who desires guidelines about this issue. of course like your website but you need to test the spelling on several of your posts. Many of them are rife with spelling problems and I find it very troublesome to inform the reality then again I¡¦ll definitely come again again. I wish to show my thanks to you for rescuing me from this predicament. Right after surfing around throughout the internet and meeting views which are not powerful, I assumed my life was well over. Living devoid of the answers to the problems you have solved by means of your good short article is a crucial case, as well as the ones that might have adversely affected my entire career if I hadn’t come across the website. Your primary training and kindness in taking care of all the stuff was priceless. I’m not sure what I would have done if I had not encountered such a subject like this. I’m able to at this time look ahead to my future. Thanks very much for the impressive and amazing help. I will not be reluctant to endorse the sites to anyone who should have guidelines about this subject. A person essentially assist to make severely posts I might state. That is the first time I frequented your website page and thus far? I surprised with the research you made to make this particular put up amazing. Wonderful activity! Hello, Neat post. There is a problem along with your site in web explorer, could test this¡K IE nonetheless is the market chief and a huge component of other people will miss your magnificent writing due to this problem. I needed to draft you the bit of word to help thank you so much again for your extraordinary thoughts you have contributed in this article. It was certainly wonderfully open-handed of people like you to deliver freely just what a few people might have advertised for an electronic book to make some profit for themselves, particularly seeing that you could possibly have tried it if you decided. These principles also acted to provide a great way to realize that other people have a similar dream the same as my very own to see great deal more with regard to this matter. Certainly there are some more pleasurable instances ahead for individuals who check out your website. What i do not realize is if truth be told how you’re not actually much more smartly-appreciated than you may be now. You’re so intelligent. You understand thus significantly in the case of this topic, produced me individually imagine it from so many varied angles. Its like women and men are not interested except it¡¦s something to do with Woman gaga! Your individual stuffs excellent. Always take care of it up! Great web site. Lots of helpful information here. I am sending it to a few buddies ans additionally sharing in delicious. And obviously, thank you in your sweat! Hi there, You’ve done a fantastic job. I will certainly digg it and personally suggest to my friends. I’m sure they will be benefited from this web site. I would like to thank you for the efforts you’ve put in writing this site. I’m hoping the same high-grade web site post from you in the upcoming as well. Actually your creative writing abilities has inspired me to get my own blog now. Really the blogging is spreading its wings rapidly. Your write up is a good example of it. My husband and i felt really satisfied that Jordan managed to finish off his investigation while using the precious recommendations he acquired from your weblog. It is now and again perplexing to simply choose to be giving for free thoughts a number of people might have been making money from. And we all know we have got you to appreciate for that. The main illustrations you’ve made, the simple web site navigation, the relationships your site make it possible to engender – it’s got all awesome, and it is letting our son and the family understand this content is amusing, and that’s wonderfully vital. Thank you for everything! Hello, Neat post. There is a problem with your web site in web explorer, could test this¡K IE still is the market leader and a good component to folks will omit your wonderful writing because of this problem. I¡¦ve learn a few just right stuff here. Certainly value bookmarking for revisiting. I surprise how a lot attempt you set to make any such wonderful informative website. obviously like your web site but you have to check the spelling on quite a few of your posts. A number of them are rife with spelling problems and I find it very troublesome to inform the reality however I will surely come again again. Youre so cool! I dont suppose Ive read something like this before. So good to search out someone with some authentic thoughts on this subject. realy thanks for beginning this up. this web site is one thing that is wanted on the net, someone with a little bit originality. helpful job for bringing one thing new to the internet! I simply want to tell you that I am very new to blogging and absolutely enjoyed you’re page. Most likely I’m going to bookmark your blog post . You certainly have beneficial well written articles. Kudos for sharing your web page. Great amazing issues here. I¡¦m very happy to see your article. Thank you so much and i’m having a look forward to contact you. Will you kindly drop me a e-mail? Hi there, I discovered your site by means of Google while searching for a related topic, your web site came up, it seems to be good. I have bookmarked it in my google bookmarks. whoah this blog is excellent i really like studying your posts. Stay up the good paintings! You realize, many individuals are searching round for this information, you can aid them greatly. I¡¦ll immediately grab your rss as I can’t find your email subscription link or newsletter service. Do you have any? Please let me recognize in order that I may subscribe. Thanks. Hiya very cool website!! Man .. Beautiful .. Wonderful .. I’ll bookmark your web site and take the feeds also¡KI’m glad to find a lot of useful info here in the submit, we’d like develop extra strategies in this regard, thanks for sharing. . . . . .
Hi there, I discovered your website by way of Google at the same time as searching for a comparable matter, your web site came up, it looks great. I’ve bookmarked it in my google bookmarks. Hiya, I am really glad I’ve found this information. Nowadays bloggers publish just about gossips and web and this is actually irritating. A good website with interesting content, that’s what I need. Thank you for keeping this web-site, I’ll be visiting it. Do you do newsletters? Can’t find it. I have to convey my gratitude for your kindness giving support to men and women who must have help on that idea. Your very own dedication to getting the solution throughout had been especially invaluable and have in most cases empowered many people just like me to get to their objectives. Your entire interesting instruction can mean much a person like me and extremely more to my office workers. Thanks a ton; from all of us. hi!,I love your writing so a lot! proportion we communicate more approximately your post on AOL? I require a specialist in this space to solve my problem. Maybe that is you! Looking ahead to look you. you’re really a just right webmaster. The site loading velocity is incredible. It kind of feels that you’re doing any unique trick. Moreover, The contents are masterpiece. you have performed a excellent job in this matter! I must express appreciation to you just for bailing me out of such a matter. As a result of looking throughout the the net and getting proposals which are not pleasant, I believed my life was done. Existing without the approaches to the difficulties you’ve resolved all through this guideline is a crucial case, as well as ones which might have adversely affected my entire career if I hadn’t come across the website. Your own personal understanding and kindness in maneuvering almost everything was very helpful. I’m not sure what I would have done if I hadn’t come across such a stuff like this. I can also now look forward to my future. Thanks very much for your professional and amazing guide. I won’t be reluctant to recommend your site to any individual who would need support on this topic. You can certainly see your expertise in the work you write. The world hopes for even more passionate writers like you who aren’t afraid to say how they believe. All the time go after your heart. Thank you so much for giving everyone such a nice possiblity to read in detail from this website. It can be very kind and also full of a great time for me personally and my office peers to visit your site at least 3 times per week to learn the latest stuff you have got. And definitely, I’m also usually contented with the great strategies you give. Some 2 areas in this article are easily the most impressive I have had. Someone essentially help to make seriously posts I would state. This is the very first time I frequented your website page and so far? I surprised with the analysis you made to make this particular publish extraordinary. Wonderful job! Thank you for another fantastic article. Where else may anyone get that type of information in such a perfect way of writing? I’ve a presentation next week, and I am at the search for such info. I’ve been browsing on-line more than 3 hours lately, yet I never found any interesting article like yours. It¡¦s beautiful value enough for me. Personally, if all site owners and bloggers made excellent content material as you did, the internet will probably be a lot more useful than ever before. What i don’t understood is in truth how you are not really much more smartly-favored than you might be now. You’re so intelligent. You realize therefore significantly in relation to this subject, produced me in my view imagine it from numerous varied angles. Its like women and men aren’t involved unless it¡¦s one thing to do with Lady gaga! Your personal stuffs outstanding. All the time handle it up! I’m still learning from you, but I’m improving myself. I certainly love reading everything that is written on your website.Keep the stories coming. I enjoyed it! Hi there. I discovered your site via Google whilst searching for a related subject, your website came up. It looks great. I have bookmarked it in my google bookmarks to come back then. Hi there. I discovered your website by way of Google even as looking for a similar topic, your web site came up. It seems to be great. I have bookmarked it in my google bookmarks to come back then. Thanks a lot for sharing this with all of us you really understand what you are talking approximately! Bookmarked. Please also visit my web site =). We may have a link trade arrangement among us! I¡¦m no longer sure the place you are getting your info, however good topic. I needs to spend a while studying much more or understanding more. Thanks for fantastic info I was on the lookout for this info for my mission. My wife and i were now satisfied Edward could round up his investigation through the entire precious recommendations he grabbed out of the web page. It’s not at all simplistic to simply possibly be giving away tactics which many others have been trying to sell. And we fully understand we now have the website owner to thank for this. The entire explanations you have made, the straightforward website navigation, the friendships your site help to instill – it’s everything powerful, and it is making our son in addition to the family recognize that that matter is enjoyable, and that’s wonderfully vital. Many thanks for the whole lot! Good ¡V I should definitely pronounce, impressed with your web site. I had no trouble navigating through all the tabs and related information ended up being truly easy to do to access. I recently found what I hoped for before you know it at all. Reasonably unusual. Is likely to appreciate it for those who add forums or anything, site theme . a tones way for your client to communicate. Nice task..
A lot of thanks for your whole hard work on this web page. Ellie enjoys working on investigation and it’s really easy to see why. A number of us hear all about the dynamic manner you render practical strategies on the web site and as well as cause contribution from other individuals on this area of interest plus our favorite princess has been starting to learn a lot. Take advantage of the remaining portion of the year. You’re the one performing a really good job. of course like your web-site but you need to check the spelling on quite a few of your posts. A number of them are rife with spelling issues and I in finding it very troublesome to inform the reality on the other hand I¡¦ll certainly come again again. Hiya, I am really glad I have found this info. Nowadays bloggers publish only about gossip and internet stuff and this is really frustrating. A good website with interesting content, that is what I need. Thank you for making this web site, and I will be visiting again. Do you do newsletters by email? Just wish to say your article is as amazing. The clearness in your post is just spectacular and i can assume you’re an expert on this subject. Fine with your permission allow me to grab your feed to keep up to date with forthcoming post. Thanks a million and please carry on the enjoyable work. Whats Happening i’m new to this, I stumbled upon this I have discovered It absolutely helpful and it has aided me out loads. I hope to contribute & aid other users like its helped me. Great job. Hiya, I’m really glad I have found this information. Nowadays bloggers publish just about gossips and net and this is actually irritating. A good website with exciting content, this is what I need. Thank you for keeping this site, I will be visiting it. Do you do newsletters? Can not find it. Hi there. I found your site by way of Google even as looking for a similar topic, your web site came up. It looks great. I’ve bookmarked it in my google bookmarks to visit then. Hey there. I found your web site by way of Google at the same time as looking for a related topic, your web site got here up. It looks good. I’ve bookmarked it in my google bookmarks to come back then. Hello there. I discovered your web site via Google whilst looking for a similar topic, your website came up. It appears great. I’ve bookmarked it in my google bookmarks to come back then. Thank you a lot for sharing this with all folks you actually know what you’re talking approximately! Bookmarked. Kindly additionally consult with my site =). We could have a link change agreement among us! I needed to put you a little bit of word to help thank you so much yet again for the stunning pointers you have featured on this page. It was quite shockingly open-handed of you to present unhampered precisely what a lot of people might have supplied as an electronic book in making some cash on their own, notably now that you might well have done it in the event you considered necessary. The concepts as well acted to be the good way to fully grasp many people have a similar eagerness much like my own to figure out somewhat more pertaining to this problem. Certainly there are many more pleasant times in the future for individuals who browse through your website. Hi there. I discovered your blog by the use of Google whilst looking for a related topic, your web site got here up. It seems good. I’ve bookmarked it in my google bookmarks to come back then. Hiya, I’m really glad I’ve found this information. Nowadays bloggers publish just about gossip and web stuff and this is actually frustrating. A good blog with exciting content, that’s what I need. Thanks for making this site, and I’ll be visiting again. Do you do newsletters by email? Hello there. I found your web site by the use of Google whilst looking for a related topic, your website got here up. It seems good. I have bookmarked it in my google bookmarks to come back then. Hiya, I’m really glad I’ve found this info. Today bloggers publish just about gossip and internet stuff and this is really frustrating. A good website with exciting content, this is what I need. Thank you for making this web-site, and I will be visiting again. Do you do newsletters by email? Hiya, I am really glad I have found this information. Today bloggers publish just about gossip and net stuff and this is really annoying. A good website with interesting content, that’s what I need. Thanks for making this web site, and I’ll be visiting again. Do you do newsletters by email? Hey there. I discovered your site by the use of Google even as looking for a related topic, your site got here up. It appears great. I’ve bookmarked it in my google bookmarks to visit then. Very well written post. It will be supportive to everyone who usess it, as well as yours truly :). Keep doing what you are doing – for sure i will check out more posts. Hiya, I am really glad I have found this information. Nowadays bloggers publish just about gossip and internet stuff and this is actually irritating. A good blog with exciting content, that is what I need. Thank you for making this web-site, and I’ll be visiting again. Do you do newsletters by email? whoah this blog is great i love studying your articles. Keep up the good paintings! You already know, a lot of persons are searching around for this info, you could aid them greatly. hello there and thank you for your info – I have certainly picked up anything new from right here. I did however expertise several technical issues using this site, since I experienced to reload the web site many times previous to I could get it to load correctly. I had been wondering if your web hosting is OK? Not that I’m complaining, but sluggish loading instances times will very frequently affect your placement in google and can damage your high quality score if ads and marketing with Adwords. Well I am adding this RSS to my e-mail and can look out for much more of your respective intriguing content. Make sure you update this again very soon..
Hiya, I’m really glad I’ve found this info. Nowadays bloggers publish just about gossip and net stuff and this is actually irritating. A good site with interesting content, that’s what I need. Thanks for making this website, and I will be visiting again. Do you do newsletters by email? Hi there. I discovered your web site by way of Google even as searching for a related matter, your site got here up. It looks good. I’ve bookmarked it in my google bookmarks to come back then. Hiya, I am really glad I’ve found this info. Nowadays bloggers publish only about gossip and internet stuff and this is actually annoying. A good blog with exciting content, this is what I need. Thank you for making this web-site, and I will be visiting again. Do you do newsletters by email? You actually make it seem so easy with your presentation but I find this topic to be really something that I believe I might never understand. It kind of feels too complex and extremely extensive for me. I’m taking a look ahead in your subsequent put up, I will try to get the grasp of it! Wonderful website. Plenty of helpful information here. I¡¦m sending it to several friends ans additionally sharing in delicious. And obviously, thank you in your sweat! Thank you for every other informative blog. The place else may I am getting that type of info written in such an ideal means? I’ve a undertaking that I am simply now running on, and I have been at the look out for such info. I’ve been surfing on-line more than 3 hours as of late, but I by no means found any interesting article like yours. It¡¦s beautiful worth sufficient for me. In my opinion, if all site owners and bloggers made good content as you probably did, the net will likely be a lot more helpful than ever before. Hiya, I am really glad I have found this info. Today bloggers publish only about gossip and internet stuff and this is actually frustrating. A good blog with exciting content, that is what I need. Thank you for making this web-site, and I’ll be visiting again. Do you do newsletters by email? Hi there. I discovered your blog by means of Google at the same time as looking for a comparable matter, your site came up. It seems good. I have bookmarked it in my google bookmarks to visit then. Hiya, I am really glad I have found this info. Nowadays bloggers publish just about gossip and web stuff and this is really frustrating. A good website with interesting content, this is what I need. Thank you for making this site, and I will be visiting again. Do you do newsletters by email? Hiya, I am really glad I have found this info. Today bloggers publish just about gossip and web stuff and this is actually irritating. A good web site with exciting content, this is what I need. Thanks for making this web-site, and I will be visiting again. Do you do newsletters by email? Hi, Neat post. There is a problem with your website in web explorer, might test this¡K IE still is the marketplace chief and a huge component to people will pass over your wonderful writing due to this problem. Hiya, I’m really glad I have found this information. Today bloggers publish just about gossip and web stuff and this is actually irritating. A good web site with interesting content, that is what I need. Thank you for making this web-site, and I’ll be visiting again. Do you do newsletters by email? Hey there. I found your site via Google at the same time as searching for a related subject, your website got here up. It seems to be great. I’ve bookmarked it in my google bookmarks to come back then. Hey there. I discovered your website by way of Google even as searching for a similar matter, your website got here up. It appears to be good. I’ve bookmarked it in my google bookmarks to come back then. Hiya, I’m really glad I’ve found this info. Today bloggers publish just about gossip and net stuff and this is actually annoying. A good site with exciting content, that’s what I need. Thanks for making this web site, and I will be visiting again. Do you do newsletters by email? Hiya, I’m really glad I’ve found this information. Today bloggers publish only about gossip and web stuff and this is really frustrating. A good site with interesting content, that’s what I need. Thanks for making this web site, and I will be visiting again. Do you do newsletters by email? Hiya, I’m really glad I’ve found this info. Nowadays bloggers publish just about gossip and web stuff and this is actually frustrating. A good web site with interesting content, this is what I need. Thank you for making this web site, and I’ll be visiting again. Do you do newsletters by email? Hello there. I found your web site via Google at the same time as looking for a similar matter, your site came up. It appears to be good. I’ve bookmarked it in my google bookmarks to visit then. Hiya, I’m really glad I’ve found this information. Today bloggers publish only about gossip and net stuff and this is actually frustrating. A good site with interesting content, that’s what I need. Thank you for making this web site, and I’ll be visiting again. Do you do newsletters by email? Just desire to say your article is as amazing. The clarity in your post is simply spectacular and i can assume you are an expert on this subject. Fine with your permission let me to grab your RSS feed to keep updated with forthcoming post. Thanks a million and please keep up the enjoyable work. Hey there. I discovered your site by the use of Google even as searching for a related subject, your site got here up. It seems to be great. I have bookmarked it in my google bookmarks to come back then. Hiya, I’m really glad I have found this information. Today bloggers publish just about gossip and internet stuff and this is actually annoying. A good blog with exciting content, this is what I need. Thank you for making this website, and I will be visiting again. Do you do newsletters by email? Hello there. I discovered your web site by way of Google whilst looking for a similar subject, your site came up. It appears great. I have bookmarked it in my google bookmarks to visit then. Hiya, I am really glad I have found this information. Today bloggers publish only about gossip and internet stuff and this is really annoying. A good site with interesting content, that’s what I need. Thanks for making this site, and I will be visiting again. Do you do newsletters by email? Hiya, I’m really glad I’ve found this info. Today bloggers publish just about gossip and internet stuff and this is actually frustrating. A good web site with interesting content, that is what I need. Thanks for making this web site, and I’ll be visiting again. Do you do newsletters by email? Hiya, I am really glad I’ve found this information. Nowadays bloggers publish only about gossip and internet stuff and this is actually irritating. A good blog with exciting content, that is what I need. Thanks for making this web-site, and I’ll be visiting again. Do you do newsletters by email? Thank you so much for giving everyone an exceptionally brilliant possiblity to read from this blog. It’s usually so terrific and also stuffed with fun for me personally and my office fellow workers to visit your website minimum thrice in 7 days to find out the fresh guides you will have. And definitely, I am also at all times pleased with the unique secrets served by you. Selected 4 facts in this post are absolutely the finest we have had. I have been browsing online more than three hours today, but I by no means discovered any interesting article like yours. It¡¦s pretty value sufficient for me. In my opinion, if all site owners and bloggers made just right content as you did, the web will probably be much more helpful than ever before. Hey there. I discovered your site via Google at the same time as looking for a related topic, your site got here up. It appears to be good. I’ve bookmarked it in my google bookmarks to visit then. Hey there. I discovered your blog via Google whilst looking for a related topic, your website came up. It appears to be great. I have bookmarked it in my google bookmarks to visit then. Hi there. I found your site by means of Google even as searching for a comparable topic, your web site got here up. It seems to be great. I’ve bookmarked it in my google bookmarks to come back then. Hi there. I found your website by way of Google whilst looking for a comparable topic, your site got here up. It seems good. I have bookmarked it in my google bookmarks to come back then. Hello there. I discovered your blog by way of Google at the same time as looking for a similar subject, your web site came up. It seems to be good. I’ve bookmarked it in my google bookmarks to visit then. Hiya, I’m really glad I have found this info. Today bloggers publish just about gossip and net stuff and this is really frustrating. A good web site with interesting content, this is what I need. Thanks for making this web site, and I’ll be visiting again. Do you do newsletters by email? great issues altogether, you just received a new reader. What might you recommend about your publish that you just made some days in the past? Any sure? Great awesome things here. I¡¦m very satisfied to see your post. Thanks so much and i’m taking a look forward to touch you. Will you please drop me a e-mail? Hiya, I’m really glad I’ve found this info. Today bloggers publish only about gossip and net stuff and this is actually irritating. A good site with exciting content, this is what I need. Thank you for making this site, and I will be visiting again. Do you do newsletters by email? My husband and i ended up being quite ecstatic that Michael managed to round up his researching from your ideas he acquired in your weblog. It is now and again perplexing just to happen to be freely giving strategies which usually some others could have been making money from. So we take into account we have you to give thanks to for this. All of the explanations you have made, the easy website menu, the relationships you make it possible to engender – it’s all fantastic, and it’s really helping our son in addition to the family imagine that the idea is thrilling, which is certainly seriously mandatory. Many thanks for all the pieces! Hello there, I found your web site by way of Google while searching for a related matter, your web site got here up, it seems to be great. I’ve bookmarked it in my google bookmarks. Hi there. I found your blog via Google while looking for a related matter, your site came up. It seems great. I’ve bookmarked it in my google bookmarks to visit then. Hiya, I’m really glad I have found this info. Today bloggers publish just about gossip and net stuff and this is really irritating. A good site with exciting content, that is what I need. Thank you for making this website, and I will be visiting again. Do you do newsletters by email? Hiya, I’m really glad I’ve found this info. Nowadays bloggers publish just about gossip and internet stuff and this is actually annoying. A good blog with exciting content, that is what I need. Thanks for making this site, and I’ll be visiting again. Do you do newsletters by email? great points altogether, you simply received a new reader. What could you suggest about your post that you made some days ago? Any certain? Hi there. I found your site by the use of Google while searching for a related matter, your site came up. It seems to be good. I’ve bookmarked it in my google bookmarks to come back then. Hi there. I found your web site via Google while looking for a related subject, your website got here up. It appears to be good. I have bookmarked it in my google bookmarks to visit then. Hiya, I am really glad I have found this info. Today bloggers publish only about gossip and net stuff and this is really irritating. A good blog with exciting content, this is what I need. Thanks for making this website, and I will be visiting again. Do you do newsletters by email? I would like to thnkx for the efforts you have put in writing this web site. I’m hoping the same high-grade blog post from you in the upcoming as well. In fact your creative writing abilities has encouraged me to get my own website now. Actually the blogging is spreading its wings rapidly. Your write up is a great example of it. I am commenting to make you understand of the beneficial encounter my wife’s princess enjoyed using your web page. She came to understand too many things, not to mention what it’s like to possess a marvelous coaching mindset to have other people smoothly comprehend a variety of specialized things. You actually surpassed visitors’ expected results. Thanks for showing such interesting, safe, informative and even easy guidance on the topic to Julie. Hi there. I found your blog via Google whilst looking for a related topic, your website got here up. It seems good. I have bookmarked it in my google bookmarks to come back then. Hiya, I’m really glad I’ve found this info. Today bloggers publish only about gossip and internet stuff and this is really frustrating. A good site with exciting content, that is what I need. Thank you for making this web-site, and I’ll be visiting again. Do you do newsletters by email? Hi there. I found your web site by means of Google while searching for a comparable matter, your site got here up. It appears to be great. I have bookmarked it in my google bookmarks to visit then. Hiya, I am really glad I’ve found this information. Today bloggers publish just about gossip and net stuff and this is really frustrating. A good website with exciting content, that’s what I need. Thank you for making this web-site, and I will be visiting again. Do you do newsletters by email? Hiya, I am really glad I’ve found this info. Today bloggers publish only about gossip and internet stuff and this is actually frustrating. A good web site with exciting content, that’s what I need. Thanks for making this site, and I will be visiting again. Do you do newsletters by email? Hi there. I found your blog via Google at the same time as looking for a related matter, your web site got here up. It seems to be great. I have bookmarked it in my google bookmarks to come back then. hi!,I really like your writing so so much! proportion we keep up a correspondence more about your post on AOL? I require a specialist in this area to solve my problem. May be that is you! Taking a look forward to see you. Hey there. I discovered your website by means of Google while looking for a related topic, your site came up. It seems to be good. I’ve bookmarked it in my google bookmarks to visit then. Hey there. I found your site by the use of Google whilst searching for a related matter, your website came up. It seems to be great. I have bookmarked it in my google bookmarks to come back then. I’m still learning from you, as I’m trying to achieve my goals. I certainly love reading all that is written on your site.Keep the tips coming. I liked it! Hey there. I discovered your web site by means of Google even as looking for a related subject, your web site came up. It appears great. I have bookmarked it in my google bookmarks to visit then. Hi there. I discovered your blog by way of Google even as searching for a similar topic, your web site got here up. It appears to be great. I have bookmarked it in my google bookmarks to visit then. Hi there. I discovered your website by way of Google even as looking for a similar subject, your web site got here up. It seems good. I’ve bookmarked it in my google bookmarks to come back then. Hiya, I am really glad I’ve found this information. Today bloggers publish just about gossip and net stuff and this is really annoying. A good blog with exciting content, this is what I need. Thank you for making this website, and I will be visiting again. Do you do newsletters by email? Hey there. I discovered your web site by way of Google while searching for a comparable matter, your site came up. It seems to be good. I have bookmarked it in my google bookmarks to visit then. Hiya, I am really glad I have found this information. Nowadays bloggers publish only about gossip and net stuff and this is actually annoying. A good web site with interesting content, that’s what I need. Thanks for making this web-site, and I’ll be visiting again. Do you do newsletters by email? Hiya, I am really glad I’ve found this information. Nowadays bloggers publish just about gossip and web stuff and this is really annoying. A good website with exciting content, this is what I need. Thank you for making this site, and I will be visiting again. Do you do newsletters by email? You completed a few nice points there. I did a search on the issue and found most people will have the same opinion with your blog. Very well written post. It will be beneficial to anybody who utilizes it, including me. Keep doing what you are doing – can’r wait to read more posts. Hi there. I discovered your blog by means of Google even as searching for a similar matter, your web site got here up. It seems great. I have bookmarked it in my google bookmarks to visit then. great issues altogether, you simply received a new reader. What may you recommend about your post that you just made a few days in the past? Any sure? Hiya, I’m really glad I have found this information. Today bloggers publish just about gossip and net stuff and this is really frustrating. A good web site with exciting content, this is what I need. Thank you for making this site, and I will be visiting again. Do you do newsletters by email? Hey there. I found your website by means of Google while searching for a comparable matter, your site came up. It appears good. I have bookmarked it in my google bookmarks to come back then. Hey there. I found your web site via Google at the same time as searching for a related topic, your site got here up. It seems to be good. I have bookmarked it in my google bookmarks to come back then. Hiya, I am really glad I’ve found this information. Nowadays bloggers publish just about gossip and net stuff and this is really annoying. A good web site with interesting content, this is what I need. Thank you for making this site, and I will be visiting again. Do you do newsletters by email? Hi there. I discovered your blog by means of Google while searching for a related topic, your site came up. It appears to be good. I’ve bookmarked it in my google bookmarks to come back then. Hiya, I’m really glad I’ve found this info. Today bloggers publish just about gossip and internet stuff and this is actually frustrating. A good site with exciting content, that’s what I need. Thanks for making this web-site, and I will be visiting again. Do you do newsletters by email? Hiya, I am really glad I have found this info. Nowadays bloggers publish only about gossip and net stuff and this is actually irritating. A good website with interesting content, this is what I need. Thank you for making this web site, and I’ll be visiting again. Do you do newsletters by email? Hi there. I discovered your site via Google while searching for a similar subject, your web site came up. It appears great. I’ve bookmarked it in my google bookmarks to come back then. Hiya, I am really glad I have found this info. Today bloggers publish only about gossip and net stuff and this is really frustrating. A good website with exciting content, this is what I need. Thank you for making this web-site, and I will be visiting again. Do you do newsletters by email? Hey there. I found your web site by means of Google at the same time as looking for a related topic, your site got here up. It appears to be great. I have bookmarked it in my google bookmarks to visit then. I do agree with all the ideas you have presented in your post. They’re very convincing and will certainly work. Still, the posts are too quick for starters. May you please prolong them a little from next time? Thank you for the post. Hiya, I’m really glad I’ve found this info. Nowadays bloggers publish only about gossip and internet stuff and this is actually irritating. A good blog with exciting content, that’s what I need. Thank you for making this web site, and I’ll be visiting again. Do you do newsletters by email? Hiya, I am really glad I have found this info. Nowadays bloggers publish only about gossip and internet stuff and this is really annoying. A good web site with interesting content, this is what I need. Thanks for making this website, and I’ll be visiting again. Do you do newsletters by email? You really make it appear so easy with your presentation however I to find this topic to be really one thing that I believe I’d never understand. It seems too complicated and extremely wide for me. I’m looking forward in your next publish, I will try to get the cling of it! whoah this blog is wonderful i really like studying your posts. Stay up the good paintings! You already know, many individuals are searching around for this information, you could aid them greatly. Hi there. I discovered your site by the use of Google even as looking for a related subject, your website came up. It seems good. I’ve bookmarked it in my google bookmarks to come back then. Hi there. I discovered your website by way of Google whilst looking for a related topic, your website came up. It appears great. I have bookmarked it in my google bookmarks to come back then. Hiya, I’m really glad I’ve found this information. Nowadays bloggers publish only about gossip and internet stuff and this is actually irritating. A good website with exciting content, this is what I need. Thank you for making this site, and I will be visiting again. Do you do newsletters by email? Hey there. I found your website via Google while searching for a similar matter, your website got here up. It appears to be great. I’ve bookmarked it in my google bookmarks to visit then. Hiya, I’m really glad I’ve found this info. Nowadays bloggers publish just about gossip and web stuff and this is really frustrating. A good site with exciting content, that is what I need. Thank you for making this site, and I will be visiting again. Do you do newsletters by email? Hello there. I found your site by means of Google at the same time as searching for a similar topic, your web site came up. It seems great. I’ve bookmarked it in my google bookmarks to visit then. Hey there. I found your website by way of Google at the same time as looking for a comparable topic, your website came up. It appears great. I’ve bookmarked it in my google bookmarks to come back then. Hi there. I found your web site by means of Google even as looking for a similar topic, your web site got here up. It looks great. I’ve bookmarked it in my google bookmarks to come back then. Hiya, I’m really glad I have found this info. Nowadays bloggers publish just about gossip and internet stuff and this is actually irritating. A good website with exciting content, that’s what I need. Thanks for making this site, and I will be visiting again. Do you do newsletters by email? Hello there. I found your blog by way of Google even as looking for a similar matter, your site came up. It seems good. I have bookmarked it in my google bookmarks to visit then. Hey there. I found your blog by the use of Google at the same time as searching for a similar subject, your site got here up. It appears to be great. I have bookmarked it in my google bookmarks to visit then. You’re so interesting! I do not suppose I have read a single thing like this before. So nice to find somebody with original thoughts on this subject. Seriously.. many thanks for starting this up. This website is something that is needed on the internet, someone with a little originality! Hiya, I’m really glad I’ve found this info. Nowadays bloggers publish only about gossip and web stuff and this is actually annoying. A good website with exciting content, this is what I need. Thanks for making this site, and I will be visiting again. Do you do newsletters by email? Hi there. I found your website via Google while looking for a comparable subject, your web site came up. It appears to be good. I’ve bookmarked it in my google bookmarks to come back then. Hey there. I found your site by means of Google even as looking for a similar subject, your website got here up. It seems to be good. I have bookmarked it in my google bookmarks to come back then. Hiya, I’m really glad I’ve found this information. Nowadays bloggers publish only about gossip and net stuff and this is actually annoying. A good website with exciting content, that is what I need. Thanks for making this web-site, and I’ll be visiting again. Do you do newsletters by email? Hi there. I discovered your web site by way of Google even as searching for a related matter, your website came up. It looks great. I’ve bookmarked it in my google bookmarks to come back then. Hi there. I discovered your blog by the use of Google whilst looking for a comparable topic, your website came up. It looks good. I’ve bookmarked it in my google bookmarks to come back then. Hiya, I’m really glad I’ve found this information. Today bloggers publish only about gossip and web stuff and this is really irritating. A good site with exciting content, this is what I need. Thanks for making this web-site, and I’ll be visiting again. Do you do newsletters by email? Hey there. I discovered your web site via Google at the same time as looking for a comparable matter, your website came up. It looks good. I have bookmarked it in my google bookmarks to visit then. Hi there. I found your website by way of Google while looking for a related topic, your website came up. It seems good. I’ve bookmarked it in my google bookmarks to visit then. Hiya, I am really glad I’ve found this info. Today bloggers publish only about gossip and web stuff and this is really irritating. A good site with exciting content, that is what I need. Thanks for making this website, and I will be visiting again. Do you do newsletters by email? Hello there. I found your blog by way of Google while looking for a similar subject, your website got here up. It appears to be good. I have bookmarked it in my google bookmarks to visit then. Hiya, I am really glad I have found this info. Nowadays bloggers publish just about gossip and web stuff and this is actually annoying. A good blog with exciting content, this is what I need. Thanks for making this web site, and I’ll be visiting again. Do you do newsletters by email? Hey there. I found your web site by means of Google at the same time as searching for a similar matter, your website came up. It appears to be great. I have bookmarked it in my google bookmarks to come back then. Hiya, I am really glad I’ve found this info. Today bloggers publish just about gossip and net stuff and this is really annoying. A good web site with interesting content, that is what I need. Thanks for making this web-site, and I’ll be visiting again. Do you do newsletters by email? Hiya, I’m really glad I’ve found this info. Today bloggers publish just about gossip and web stuff and this is actually annoying. A good web site with exciting content, this is what I need. Thank you for making this web-site, and I will be visiting again. Do you do newsletters by email? Hi there. I found your website via Google while searching for a related subject, your site came up. It appears to be great. I’ve bookmarked it in my google bookmarks to come back then. Hiya, I am really glad I have found this information. Today bloggers publish only about gossip and web stuff and this is actually irritating. A good site with exciting content, that is what I need. Thanks for making this site, and I will be visiting again. Do you do newsletters by email? Hey there. I found your website by way of Google at the same time as searching for a related topic, your site got here up. It seems to be great. I have bookmarked it in my google bookmarks to come back then. Excellent post. I was checking constantly this blog and I’m impressed! Extremely helpful info specially the last part 🙂 I care for such info much. I was looking for this certain information for a very long time. Thank you and best of luck. Hiya, I am really glad I’ve found this info. Today bloggers publish only about gossip and internet stuff and this is actually annoying. A good site with interesting content, that’s what I need. Thank you for making this site, and I’ll be visiting again. Do you do newsletters by email? Hiya, I’m really glad I’ve found this information. Nowadays bloggers publish just about gossip and internet stuff and this is really annoying. A good blog with interesting content, that is what I need. Thanks for making this website, and I will be visiting again. Do you do newsletters by email? Hiya, I am really glad I’ve found this info. Today bloggers publish only about gossip and net stuff and this is really frustrating. A good website with interesting content, this is what I need. Thank you for making this web site, and I’ll be visiting again. Do you do newsletters by email? Hey there. I found your blog by way of Google at the same time as searching for a similar matter, your site came up. It looks great. I’ve bookmarked it in my google bookmarks to come back then. Hey there. I found your blog via Google at the same time as looking for a related topic, your web site got here up. It seems to be good. I have bookmarked it in my google bookmarks to come back then. Hiya, I’m really glad I have found this info. Nowadays bloggers publish only about gossip and internet stuff and this is actually frustrating. A good web site with interesting content, this is what I need. Thank you for making this web-site, and I will be visiting again. Do you do newsletters by email? Hey there. I discovered your website by way of Google even as looking for a related subject, your site got here up. It appears great. I’ve bookmarked it in my google bookmarks to visit then. Hiya, I am really glad I’ve found this information. Today bloggers publish only about gossip and web stuff and this is actually frustrating. A good website with interesting content, that is what I need. Thank you for making this web-site, and I’ll be visiting again. Do you do newsletters by email? Hiya, I am really glad I have found this information. Today bloggers publish only about gossip and web stuff and this is really frustrating. A good web site with exciting content, that is what I need. Thank you for making this website, and I will be visiting again. Do you do newsletters by email? Hi there. I discovered your web site by way of Google at the same time as searching for a related matter, your web site came up. It appears great. I have bookmarked it in my google bookmarks to come back then. Hiya, I am really glad I’ve found this info. Today bloggers publish just about gossip and internet stuff and this is actually irritating. A good website with interesting content, this is what I need. Thank you for making this website, and I will be visiting again. Do you do newsletters by email? Hiya, I’m really glad I have found this info. Today bloggers publish just about gossip and web stuff and this is really frustrating. A good site with interesting content, that is what I need. Thank you for making this web-site, and I’ll be visiting again. Do you do newsletters by email? Hiya, I’m really glad I’ve found this information. Nowadays bloggers publish just about gossip and web stuff and this is actually frustrating. A good web site with interesting content, that’s what I need. Thanks for making this web site, and I’ll be visiting again. Do you do newsletters by email? Hello there. I found your web site by way of Google whilst searching for a related subject, your site came up. It seems good. I have bookmarked it in my google bookmarks to visit then. Hello there. I discovered your web site via Google even as looking for a similar matter, your site got here up. It appears to be great. I have bookmarked it in my google bookmarks to visit then. Hi there. I found your website by way of Google even as searching for a related matter, your website came up. It seems good. I have bookmarked it in my google bookmarks to come back then. Hiya, I’m really glad I have found this info. Nowadays bloggers publish just about gossip and internet stuff and this is really annoying. A good site with interesting content, that is what I need. Thanks for making this web site, and I will be visiting again. Do you do newsletters by email? Hello there. I found your blog by the use of Google even as looking for a similar subject, your website came up. It looks good. I have bookmarked it in my google bookmarks to visit then. Hiya, I am really glad I have found this info. Nowadays bloggers publish only about gossip and net stuff and this is actually annoying. A good website with interesting content, that is what I need. Thank you for making this site, and I’ll be visiting again. Do you do newsletters by email? Hiya, I am really glad I’ve found this info. Nowadays bloggers publish only about gossip and web stuff and this is actually frustrating. A good blog with interesting content, that is what I need. Thanks for making this web-site, and I’ll be visiting again. Do you do newsletters by email? Hey there. I discovered your web site by way of Google at the same time as looking for a comparable matter, your website came up. It looks great. I’ve bookmarked it in my google bookmarks to come back then. Howdy very cool website!! Man .. Excellent .. Superb .. I’ll bookmark your web site and take the feeds additionally¡KI am happy to search out a lot of helpful information here within the publish, we need develop extra techniques on this regard, thank you for sharing. . . . . .
Hiya, I am really glad I’ve found this information. Nowadays bloggers publish just about gossip and web stuff and this is really frustrating. A good blog with interesting content, that is what I need. Thank you for making this web site, and I will be visiting again. Do you do newsletters by email? Hi there. I discovered your website by way of Google while searching for a comparable topic, your site got here up. It appears great. I have bookmarked it in my google bookmarks to come back then. Hiya, I’m really glad I have found this information. Today bloggers publish just about gossip and internet stuff and this is really irritating. A good web site with exciting content, this is what I need. Thank you for making this site, and I will be visiting again. Do you do newsletters by email? Thank you a lot for providing individuals with such a marvellous opportunity to check tips from this website. It is always so fantastic and packed with a lot of fun for me personally and my office mates to visit the blog the equivalent of 3 times in a week to find out the new guides you have got. And of course, I am also usually satisfied concerning the wonderful creative ideas served by you. Certain 2 ideas on this page are absolutely the very best I’ve ever had. Hiya, I am really glad I have found this information. Nowadays bloggers publish just about gossip and web stuff and this is really irritating. A good website with interesting content, that is what I need. Thank you for making this site, and I will be visiting again. Do you do newsletters by email? Hey there. I discovered your blog by the use of Google while looking for a related topic, your site came up. It appears great. I have bookmarked it in my google bookmarks to visit then. Hey there. I discovered your site via Google even as searching for a similar topic, your website got here up. It seems great. I’ve bookmarked it in my google bookmarks to come back then. Hiya, I’m really glad I’ve found this info. Nowadays bloggers publish just about gossip and net stuff and this is really annoying. A good blog with exciting content, this is what I need. Thanks for making this website, and I will be visiting again. Do you do newsletters by email? Hi there. I found your website via Google even as looking for a related subject, your site came up. It appears great. I’ve bookmarked it in my google bookmarks to come back then. Hiya, I’m really glad I’ve found this information. Nowadays bloggers publish only about gossip and net stuff and this is really frustrating. A good blog with interesting content, that’s what I need. Thank you for making this site, and I’ll be visiting again. Do you do newsletters by email? Hiya, I am really glad I’ve found this info. Today bloggers publish just about gossip and internet stuff and this is really irritating. A good blog with exciting content, this is what I need. Thank you for making this web site, and I’ll be visiting again. Do you do newsletters by email? Hi there. I found your web site by means of Google whilst searching for a comparable topic, your website got here up. It appears to be great. I’ve bookmarked it in my google bookmarks to visit then. Hiya, I’m really glad I’ve found this information. Nowadays bloggers publish only about gossip and web stuff and this is actually irritating. A good web site with interesting content, this is what I need. Thanks for making this site, and I will be visiting again. Do you do newsletters by email? Hey there. I discovered your site by the use of Google at the same time as looking for a comparable matter, your website came up. It looks great. I have bookmarked it in my google bookmarks to visit then. Hiya, I’m really glad I have found this info. Today bloggers publish only about gossip and web stuff and this is really annoying. A good website with interesting content, that’s what I need. Thanks for making this site, and I will be visiting again. Do you do newsletters by email? Hello there. I discovered your blog by means of Google at the same time as looking for a related matter, your web site came up. It seems to be great. I’ve bookmarked it in my google bookmarks to come back then. in the near future. Please visit my website too and tell me how you feel. Hi there. I found your website via Google while looking for a related matter, your web site came up. It looks great. I’ve bookmarked it in my google bookmarks to come back then. Hey there. I found your website via Google while looking for a similar subject, your web site got here up. It seems to be good. I’ve bookmarked it in my google bookmarks to come back then. Hi there. I found your website by way of Google while looking for a similar matter, your site got here up. It seems to be good. I have bookmarked it in my google bookmarks to come back then. Hey there. I found your site by way of Google while looking for a similar subject, your website got here up. It looks great. I have bookmarked it in my google bookmarks to visit then. Hiya, I am really glad I have found this info. Today bloggers publish just about gossip and net stuff and this is really annoying. A good site with exciting content, that is what I need. Thanks for making this website, and I will be visiting again. Do you do newsletters by email? Hiya, I am really glad I have found this information. Today bloggers publish just about gossip and web stuff and this is actually frustrating. A good website with exciting content, this is what I need. Thanks for making this web site, and I’ll be visiting again. Do you do newsletters by email? Hey there. I discovered your website by way of Google whilst looking for a related topic, your site came up. It appears good. I’ve bookmarked it in my google bookmarks to come back then. Hiya, I’m really glad I’ve found this information. Today bloggers publish just about gossip and web stuff and this is really irritating. A good website with exciting content, that’s what I need. Thank you for making this site, and I will be visiting again. Do you do newsletters by email? Hiya, I am really glad I have found this information. Nowadays bloggers publish only about gossip and net stuff and this is actually frustrating. A good site with exciting content, that is what I need. Thanks for making this web site, and I’ll be visiting again. Do you do newsletters by email? Hiya, I am really glad I’ve found this information. Today bloggers publish only about gossip and net stuff and this is actually annoying. A good blog with interesting content, that’s what I need. Thank you for making this web-site, and I’ll be visiting again. Do you do newsletters by email? Hiya, I am really glad I have found this info. Nowadays bloggers publish only about gossip and net stuff and this is really frustrating. A good site with interesting content, that is what I need. Thanks for making this website, and I’ll be visiting again. Do you do newsletters by email? Hey there. I discovered your web site by the use of Google at the same time as looking for a related subject, your web site came up. It seems to be good. I’ve bookmarked it in my google bookmarks to come back then. Hiya, I am really glad I have found this information. Nowadays bloggers publish only about gossip and net stuff and this is really annoying. A good blog with exciting content, this is what I need. Thank you for making this website, and I’ll be visiting again. Do you do newsletters by email? Hiya, I’m really glad I’ve found this info. Today bloggers publish only about gossip and net stuff and this is really frustrating. A good web site with exciting content, this is what I need. Thanks for making this website, and I will be visiting again. Do you do newsletters by email? magnificent post, very informative. I’m wondering why the opposite specialists of this sector do not notice this. You should continue your writing. I am confident, you have a huge readers’ base already! Hiya, I’m really glad I have found this info. Today bloggers publish just about gossip and web stuff and this is actually frustrating. A good blog with exciting content, that is what I need. Thanks for making this site, and I will be visiting again. Do you do newsletters by email? Hello there. I discovered your blog by way of Google even as searching for a related subject, your site got here up. It appears to be good. I’ve bookmarked it in my google bookmarks to visit then. Hi there. I discovered your site by the use of Google while looking for a similar matter, your web site got here up. It seems great. I have bookmarked it in my google bookmarks to visit then. Hi there. I discovered your web site by way of Google whilst looking for a similar subject, your website got here up. It appears to be good. I have bookmarked it in my google bookmarks to visit then. Hey there. I found your site via Google whilst looking for a related subject, your website got here up. It looks great. I have bookmarked it in my google bookmarks to visit then. Hey there. I found your blog via Google whilst looking for a comparable topic, your site got here up. It seems good. I’ve bookmarked it in my google bookmarks to come back then. Hello there. I discovered your website by way of Google even as looking for a similar topic, your website came up. It seems to be good. I have bookmarked it in my google bookmarks to visit then. Hiya, I’m really glad I’ve found this information. Nowadays bloggers publish just about gossip and net stuff and this is actually frustrating. A good site with exciting content, this is what I need. Thank you for making this website, and I will be visiting again. Do you do newsletters by email? Hey there. I discovered your site by means of Google even as looking for a comparable subject, your web site got here up. It appears great. I have bookmarked it in my google bookmarks to visit then. It seems there are internet sites and also blogs devoted to numerous activities, such television, music, lives of stars, and so on. Yet I truly can not locate internet sites and blogs devoted to reading, sadly an afterthought when it concerns pastimes … Any person recognize some actually preferred as well as fantastic ones? Timeless and also current literary works are both great with me, because I check out both … Many thanks so much! =o-RRB-. Hiya, I’m really glad I have found this info. Today bloggers publish just about gossip and internet stuff and this is really irritating. A good website with exciting content, that’s what I need. Thank you for making this website, and I’ll be visiting again. Do you do newsletters by email? Hello there. I discovered your blog by means of Google at the same time as looking for a comparable topic, your website got here up. It seems great. I’ve bookmarked it in my google bookmarks to visit then. Hiya, I’m really glad I’ve found this info. Today bloggers publish only about gossip and web stuff and this is actually irritating. A good web site with interesting content, that’s what I need. Thanks for making this website, and I will be visiting again. Do you do newsletters by email? Hello there. I found your web site via Google even as looking for a similar topic, your site came up. It seems to be good. I have bookmarked it in my google bookmarks to come back then. Hey there. I discovered your site by means of Google whilst looking for a related subject, your web site got here up. It seems great. I have bookmarked it in my google bookmarks to come back then. Hi there. I discovered your web site via Google while searching for a related subject, your web site got here up. It seems to be good. I have bookmarked it in my google bookmarks to come back then. Hiya, I am really glad I’ve found this information. Nowadays bloggers publish just about gossip and web stuff and this is actually irritating. A good site with exciting content, this is what I need. Thanks for making this web site, and I will be visiting again. Do you do newsletters by email? Hi there. I discovered your web site via Google whilst looking for a comparable matter, your website came up. It seems to be good. I’ve bookmarked it in my google bookmarks to visit then. Hiya, I’m really glad I have found this info. Today bloggers publish only about gossip and internet stuff and this is really frustrating. A good blog with interesting content, that’s what I need. Thanks for making this web-site, and I will be visiting again. Do you do newsletters by email? Hello there. I discovered your web site by way of Google while searching for a comparable topic, your website came up. It looks good. I’ve bookmarked it in my google bookmarks to come back then. Hiya, I’m really glad I’ve found this information. Today bloggers publish only about gossip and net stuff and this is really frustrating. A good website with interesting content, that’s what I need. Thank you for making this web-site, and I’ll be visiting again. Do you do newsletters by email? I was just looking for this information for some time. After 6 hours of continuous Googleing, finally I got it in your site. I wonder what’s the lack of Google strategy that do not rank this type of informative websites in top of the list. Normally the top sites are full of garbage. Hi there. I discovered your site via Google at the same time as looking for a comparable matter, your website came up. It looks great. I’ve bookmarked it in my google bookmarks to come back then. Hi there. I discovered your web site by means of Google at the same time as looking for a similar subject, your site came up. It seems to be great. I’ve bookmarked it in my google bookmarks to come back then. Hiya, I am really glad I have found this info. Nowadays bloggers publish only about gossip and internet stuff and this is actually frustrating. A good site with interesting content, this is what I need. Thank you for making this site, and I’ll be visiting again. Do you do newsletters by email? Hiya, I’m really glad I’ve found this information. Today bloggers publish only about gossip and internet stuff and this is really annoying. A good website with interesting content, this is what I need. Thanks for making this site, and I will be visiting again. Do you do newsletters by email? Hi there. I found your website by way of Google at the same time as looking for a similar matter, your website got here up. It seems good. I’ve bookmarked it in my google bookmarks to visit then. Hiya, I’m really glad I have found this info. Today bloggers publish just about gossip and net stuff and this is actually irritating. A good blog with interesting content, that’s what I need. Thank you for making this web site, and I’ll be visiting again. Do you do newsletters by email? Hello there. I found your site by way of Google whilst looking for a related matter, your website came up. It appears great. I’ve bookmarked it in my google bookmarks to come back then. Hey there. I discovered your website by means of Google while searching for a related matter, your website came up. It seems to be good. I have bookmarked it in my google bookmarks to come back then. whoah this weblog is magnificent i love studying your articles. Keep up the good work! You know, a lot of persons are searching around for this info, you could aid them greatly. I’m still learning from you, but I’m trying to achieve my goals. I certainly enjoy reading everything that is written on your blog.Keep the aarticles coming. I loved it! Hiya, I am really glad I have found this info. Today bloggers publish only about gossip and internet stuff and this is really irritating. A good website with interesting content, that’s what I need. Thanks for making this web-site, and I’ll be visiting again. Do you do newsletters by email? Hi there. I found your site by means of Google whilst looking for a comparable matter, your web site got here up. It appears good. I have bookmarked it in my google bookmarks to visit then. Hiya, I’m really glad I’ve found this info. Today bloggers publish only about gossip and internet stuff and this is really annoying. A good blog with interesting content, this is what I need. Thank you for making this website, and I’ll be visiting again. Do you do newsletters by email? Hello there. I found your web site via Google while searching for a similar subject, your website came up. It seems to be good. I have bookmarked it in my google bookmarks to come back then. Hey there. I found your web site by the use of Google even as looking for a comparable subject, your website came up. It seems good. I have bookmarked it in my google bookmarks to come back then. Hiya, I’m really glad I have found this information. Today bloggers publish only about gossip and internet stuff and this is really frustrating. A good blog with interesting content, this is what I need. Thanks for making this web site, and I’ll be visiting again. Do you do newsletters by email? Hiya, I’m really glad I’ve found this information. Nowadays bloggers publish just about gossip and net stuff and this is really frustrating. A good website with interesting content, that is what I need. Thanks for making this web site, and I will be visiting again. Do you do newsletters by email? Hiya, I am really glad I have found this information. Nowadays bloggers publish only about gossip and web stuff and this is actually irritating. A good site with exciting content, that is what I need. Thanks for making this website, and I’ll be visiting again. Do you do newsletters by email?